In the search for stories for The View from Fez, the team takes to the road from time to time. 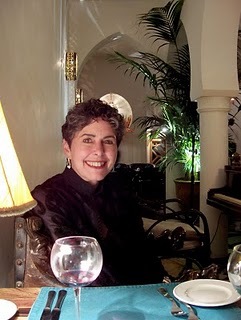 Helen Ranger reports from Casablanca. Over dinner at the Blue Parrot above Rick's Cafe, owner Kathy Kriger told us that she had recently been appointed to head a committee formed by the governor of Casablanca that will oversee the ugrading of the city's small medina. Kathy reported that the run-down medina by the sea has a Spanish church and a synagogue, as well as a fondouk that could be restored in addition to the housing and shops. 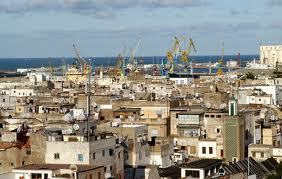 But this is not simply to attract tourists to the medina; it's a project to uplift the community living there. She spent some years restoring the magnificent art deco building that houses Rick's Cafe, and feels greatly honoured to be appointed to this position. The medina was the original settlement at Casablanca. It was the French who built the ville nouvelle during the protectorate years and most people who live in the city now are not original inhabitants. And the city continues to grow - there are innumerable building projects and a tramway is being constructed that should be ready in a couple of years' time. The committee asked King Mohammed VI for funding for the project. His Majesty recently visited the medina, and decided that as it was such an important project, he would allocate a great deal more than was originally requested. See all The View from Fez POSTCARDS HERE.